On 17th September 2012 a new volume will be added to the BFI's best-selling series of transport and travel films, The British Transport Films Collection. London on the Move, the tenth in the series of double-DVD sets, focuses on the films that the BTF Film Unit produced for London Transport in the post-war period – films that explore the workings of the capital's bus and underground train networks. Spanning nearly 40 years from 1947-1983, the films will not only appeal to transport enthusiasts, but can be relished and enjoyed by anyone with an interest in British social history or documentary filmmaking. Following the nationalisation of transport in 1948, the British Transport Commission set up its own in-house film production unit. Launched on 1st May 1949, and led for 25 years by Edgar Anstey – a founding father of the British documentary movement – it became one of the largest industrial film units in Britain. Highlights of Volume Ten include the classics All that Mighty Heart, Under Night Streets and Overhaul, as well as rare gems like Power Signal Lineman and Our Canteens. This selection has been digitally remastered for this release and is accompanied by a booklet of film notes. All that Mighty Heart (1963): a day-in-the-life of London's arterial transport networks, filmed across London and its suburbs between 1953 and 1963. Our Canteens (1951): a fascinating and informative staff instructional film which was shown to all new canteen service recruits as a training aid. One for One (1964): a detailed record of the full mechanical and electrical overhaul that London's buses received after every 200,000 miles of service. The Nine Road (1975): this film shows all the aspects of running the “Nine Road”, one of London's oldest and most used bus routes that runs right across town. London on the Move (1970): with its 250 miles of track and 5,000 miles of bus routes, the daily running of London Transport was enormously complex, as this film shows. Under Night Streets (1958): a glimpse into the world of the 1,100 strong labour force which sets to work on London's underground lines every night, after the last train has departed. Power Signal Lineman (1953): this film formed part of LT's training course for the Underground's Power Signal Linemen. Omnibus 150 (1979): this film, which was produced to mark the 150th anniversary of the first London Omnibus, charts the evolution of public transport by bus in London. Cine Gazette No.10 (1951): a newsreel-style production relaying information about London Transport's bus and underground services. Moving London (1983): an ex-LT employee describes how the London Transport network has modernised and expanded during the 50 years since it was created. AFC: Automatic Fare Collection and You (1969): an amusing animated short, made to coincide with the opening of the new Victoria Line. Overhaul (1957): this film takes a look at the operation at Aldenham, where London's buses are made to look new again after serving four years' service on the road. 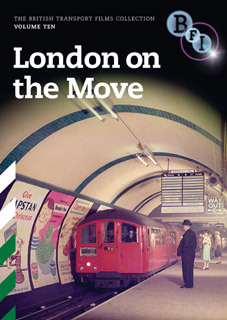 London on the Move will be released on 2-disc DVD by the BFI on 17th September 2012 at the RRP of £19.99. Comprehensive booklet with new essays and film notes by Patrick Russell (BFI) and Stephen Edwards.